Over the years, I’ve seen and heard countless people ask about how to build a fire in a Kamado style grill in order to get smoke through out a low and slow cook. In fact, just this morning I was asked in a PM about this very topic. If you just put wood on top of the coals, it will burn up at the beginning of your cook. You can always take out your plate setter or your heat deflector and add more wood, but you lose heat, its awkward (where do you place that hot plate setter?) and will end up adding time to your total cook. Who wants that? The answer is pretty simple. When filling up your firebowl, add wood mixed in with the lump charcoal. Place a layer of charcoal on the bottom, then add your wood chunks (or chips. Or a mixture of both), add more charcoal, then more wood chunks and repeat until your firebowl is full. 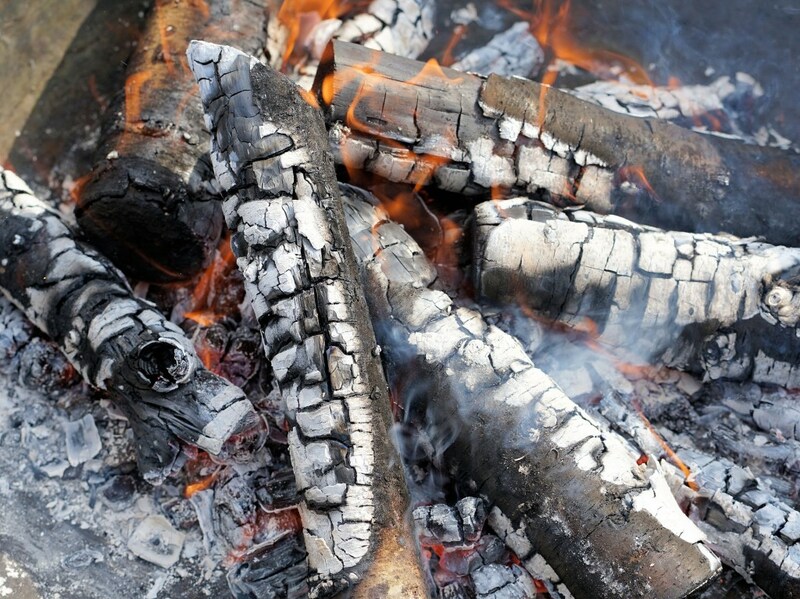 As the fire burns down, it will continue to hit fresh wood which will ensure smoke through out the cook. Voila! Easy peasy. Simple as could be. Note that on a low and slow, you will have a small fire and it will be contained pretty much too a small cylinder in the middle of you bowl. For that reason, just add the wood to the center. No need to spread it out towards the edges as the fire probably won’t ignite any wood there. I’d like to be able to take credit for creating the above illustration, but in truth it’s been floating around the ole interweb for years on various forums. I believe credit should go to a guy named Stike, but sadly he is no longer active on the Egghead forum. Previous: Previous post: Happy Friday the 13th!! And Happy Father’s Day!! Hey! 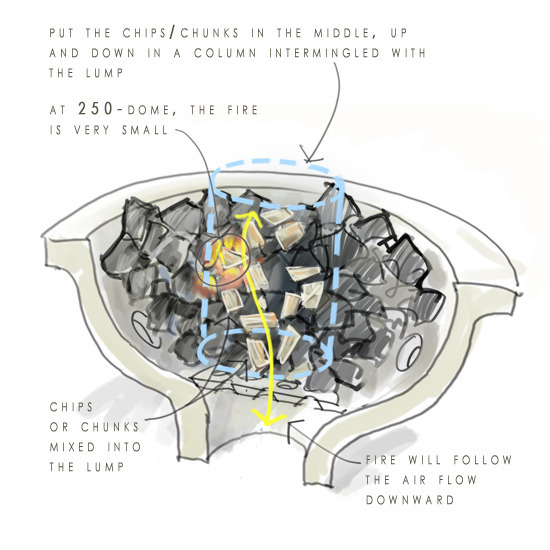 A couple weeks ago we had an Argentine asado in our backyard and our visiting friends from Argentina talked my husband into using two of our portable fire pits – like in the illustration above to do it! They would not have anything to do with the gas grill. You might enjoy seeing the post on my blog – it’s the first post this month and it was quite the night! I miss Stike. He was one of my favorites on the forum. Keep spreading the gospel of low bad slow. I’m able to get HOURS out of the classic minion method. Great post! Minion method is a great trick. Still use it on my offset when cooking down at the ranch.